This entry was posted in .Net, Blogroll, PC, Personal, Programming, Windows. Bookmark the permalink. Really nice work, I was also looking to do something with messenger a couple of months ago. Do you know something about running messenger in context of some other applicaiton. Let me know if you have seen a related article. can u give me some detail about it , what do u meant by context ? is it spawing it from some other application or is it about its integration with other apps.?? bhai tou tou cha gaya hai…..
Could you give me any idea why I get this error msg “..Reference to C:\..client.dll” could not be added. This is not a valid assembly or COM component….Only assemblies with extension dll or COM can be referenced…” when I try to add a reference to MessengerClient.dll in C:\Program Files\MSN Messenger folder. I really appreciate for your time and consideration in advance. Hi, I’ve developed a Messenger add-in for my programming Blog. To reply to a question of a user of mine, I ask you this question: this user can’t run the add-in because a System.SecurityException occurs, perhaps because he wants to read data from a file. The add-in contains a strong-name. So, do you think tha installing the assembly in the GAC would solve this issue? yes, adding the assembly to the GAC will resolve your issue. when messenger loads a plugin , it creates a sand box by loading a instance of CLR for that messenger. Every add in runs in its own clr instance. By default , the clr runs in Internet security zone, which means it has almost no level of trust. when you add your assembly to gac, you are increasing the trust level. and when the messenger loads a assembly which gaced it lowers the security restrictions. 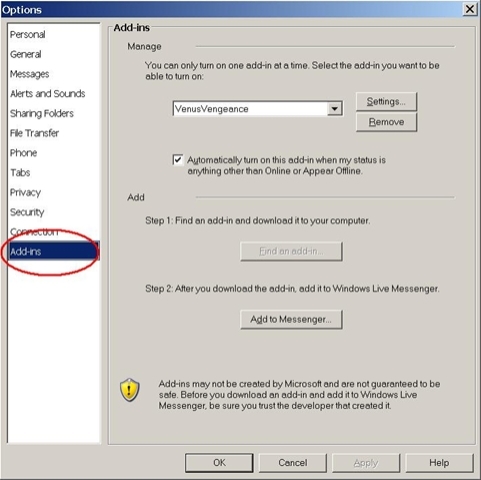 to successfully achieve the results, first remove the add-in from messenger. gac ur assembly then add the add-in again. Many thanks. Your technical explanation was very useful. Now the plug-in works fine. I also suggested to my user to try the .NET IsolatedStorage classes for reading/writing files in a sand-boxed environment. This also should work. i havent played with isolated storage classes yet. thanks for pointing that. I had posted an issue sometime back for which I haven’t received any suggestions yet. Could you please give me a hint about where I went wrong here or how can I solve this issue? well i have already sent you an email on ur hotmail account , i don’t know if you have received that or not, i am copying the response as follows. ” well I think you are not using windows live messenger, the Add-In support is available only in Windows lIve Messenger. as a check do one thing ,try dissembling MessengerClient.dll with ildasm , if it can be dissembled then its a valid assembly. also try compiling the code via cmd line. btw .net 2 is minimum required version of the framework. let me know about ur findings. btw I will be uploading it in a few days so you can download it directly.